Peppy and supportive, Gluten Free Soul Pilot contains much good advice about prioritizing personal wellness. 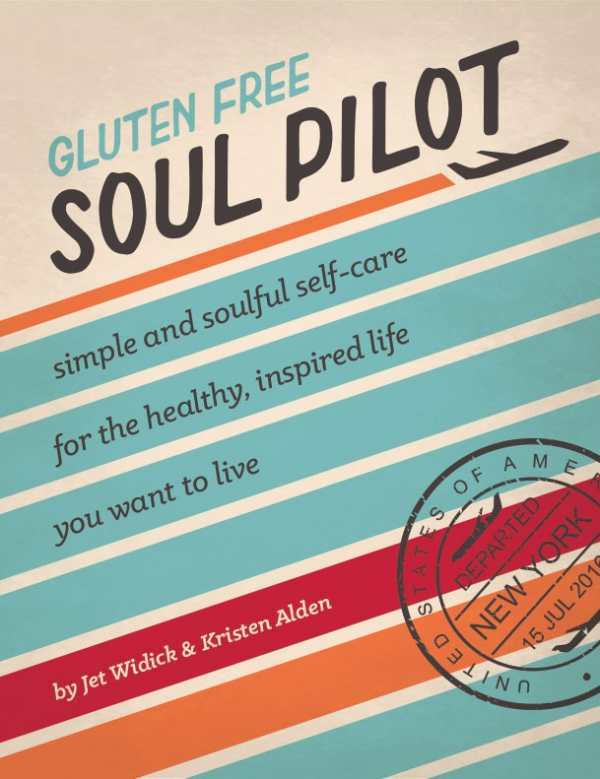 Jet Widick’s name provides the aviation-themed framework for her inspirational guide to wellness and self-care, Gluten Free Soul Pilot. She and co-author Kristen Alden expand on the prescriptions for a balanced, healthy life that appear on Jet’s popular blog Gluten Free Sage, served with plenty of poetry, photographs, quotes, and recipes. A former nurse, Jet suffered from an array of symptoms for years before finally being diagnosed with celiac disease. This autoimmune disease damages the intestines and can only be managed if celiac sufferers completely remove gluten from their diet. Her experiences in reclaiming her health and strength, combined with her passion for empowering others with celiac or other health issues, make for lively, uplifting reading. Though the recipes in the book are all gluten free, the motivational messages are not exclusive to folks with the disease; they apply to anyone looking to adopt a healthier lifestyle. The book is organized as a “flight plan” for gradually and systematically changing one’s personalized diet, exercise regime, mental and health habits, and other steps to bring life back into balance. The authors are gentle and nonjudgmental in their tone, constantly offering encouraging advice about making realistic, small changes toward more healthy life choices. They advocate many different simple, cost-conscious strategies (Drink more water! Move around more! Do something creative!) for addressing unhealthy habits and moving toward greater health without having to invest in expensive diet foods or gym memberships. The text is punched up with colorful photographs, thought-provoking quotes from such diverse personalities as Yogi Berra and Rumi, and snippets of Jet’s upbeat poetry. The recipe section features gluten-free, easy-to-prepare foods that demonstrate the authors’ principles of healthy eating. They showcase nutrient-dense, unprocessed ingredients, with an emphasis on vegetables (though there are no less than four meatball recipes) and ease of cooking. Kitchen shortcuts like bags of frozen vegetables, salads, and slaws are well-represented, and the unfussy dishes use a minimum of ingredients, short cooking times, and simple techniques. The extended aviation metaphor does get tiresome. Chapters lead off with quotes about aerodynamic theory and there are constant airplane analogies. Photographs are not captioned and, particularly in the recipe section, can be confusing. Frequent references to specific food brands (Cello Whisps, Bone Sucking Sauce) are discordant product placements that detract from the book’s otherwise solid, uncommercial messages. Peppy and supportive, Gluten Free Soul Pilot contains much good advice about prioritizing personal wellness in busy, overstimulated lives, emphasizing the importance of self care in healing and preventing illnesses.